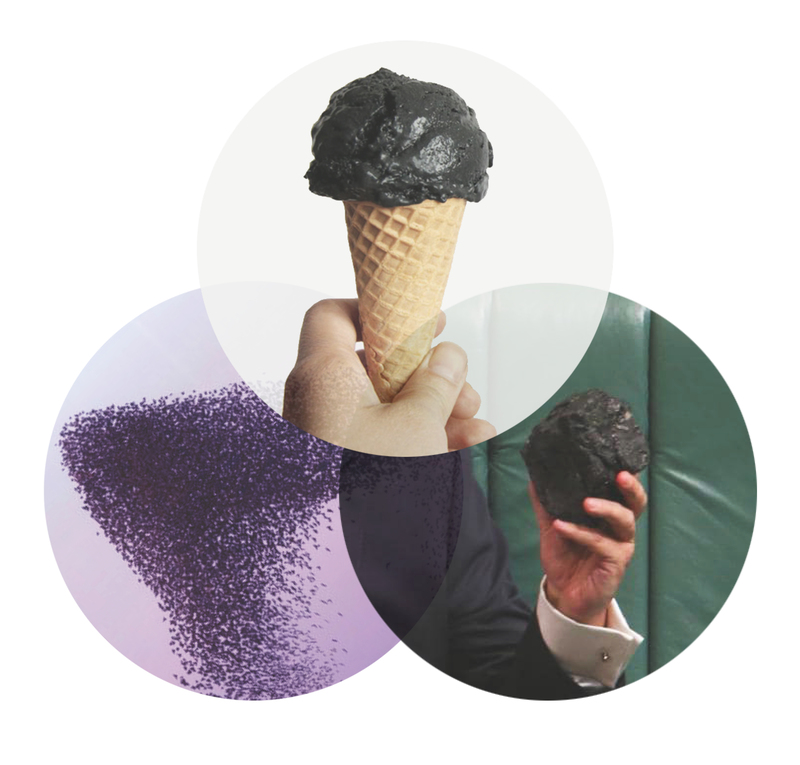 A Centre for Everything present a new project that reflects on the ways in which the fossil fuel industry ingratiates itself to the Australian public. The project adopts A Centre for Everything’s signature triadic formation, bringing together the topics of Ice Coal, Data Networks and Collectiveactivity to converge in generative and revealing ways. A Centre for Everything will present a replica of mining magnate Gina Rinehart’s public sculpture, Our Future, a 30-ton iron ore boulder inscribed with a poem lamenting mining taxes. Built with retractable handles and wheels, A Centre for Everything’s object will double as a portable ice cream cart from which ‘ice coal’ will be served during select events throughout the exhibition. Alongside this serving sculpture, A Centre for Everything will also present a collectively-generated live data map, showing links between Australian cultural organisations and the fossil fuel industry. An accompanying round table discussion will address the practice and effect of artists who use data collection to incite social and industrial change within the arts relating to gender representation, working conditions, climate change and industrial ethics. It will comprise key artists in the field, including CoUNTess, Burak Arikan, Cristen Tilley, Nathan Hoad and Ben Spraggon (co-creators of Bear Finds a Voice) and the Artists’ Subcommittee. In addition, A Centre for Everything will host a play-based learning workshop, consisting of exercises and tasks examining the nature of collectivity. Taking place in the MUMA forecourt, the workshop will see participants partake in physical, social and discursive activities that allow them to critically enact and reflect upon their group intelligence, behaviour and decision-making processes. Borrowing from the New Games movement, swarm theory, dance exercises and theories of social learning, this workshop will culminate in a collaborative text-based statement, which will be displayed as part of the exhibition. A Centre for Everything is an independent creative and pedagogical project that engages individuals and communities to learn, create, discuss and eat together. Their collaborative events bring together diverse topics as performances, presentations, workshops, readings, discussions, critiques, demonstrations and meals. Founded in 2012 by artists Will Foster and Gabrielle de Vietri, the program operates in collaboration with guest presenters, guest programmers and a handful of volunteers. Scientists, artists, ecologists, journalists, teachers, thinkers, activists and more are invited to become part of their socially-engaged, intellectually-stimulated, creative community. Participants are artists and non-artists, friends and strangers, academics and enthusiasts, specialists and generalists.